Members of the Freisberg family accept the 2018 Family of the Year award. From left: Easton Hoard, Rumiko Freisberg, Asher Freisberg, Reese Freisberg, Skyla Freisberg, Flor Freisberg, Alexis Freisberg, Richard Freisberg, Mae Hoard, Anna Hoard, Jackie Freisberg and Abel Hoard. | Download this photo. MANHATTAN — Members of the Freisberg family may be separated by hundreds of miles, but that doesn't stop them from gathering together to share their pride for Kansas State University. On Saturday, Sept. 15, the family met in Manhattan to celebrate a special honor. The Freisbergs were recognized with the 2018 Family of the Year award during the university's 90th Family Day on Sept. 15. The family's history at Kansas State University began with John Freisberg, who attended Kansas State University in the 1960s. Three of his children also attended the university. Anna Freisberg Hoard, a 1996 graduate, received her Bachelor of Architecture and a minor in planning; Reese Freisberg, a 1999 graduate, received his bachelor's degree in horticulture/turf management, a secondary degree in natural resources and environmental science, and a minor in German; and Richard Freisberg, who attended until 2002 and majored in chemical engineering with a minor in Spanish. While not all of the Freisberg children attended K-State, they share their dad's passion for K-State — along with their mother Jackie — and show their Wildcat pride from Arkansas, Georgia, Oklahoma, Texas and internationally. 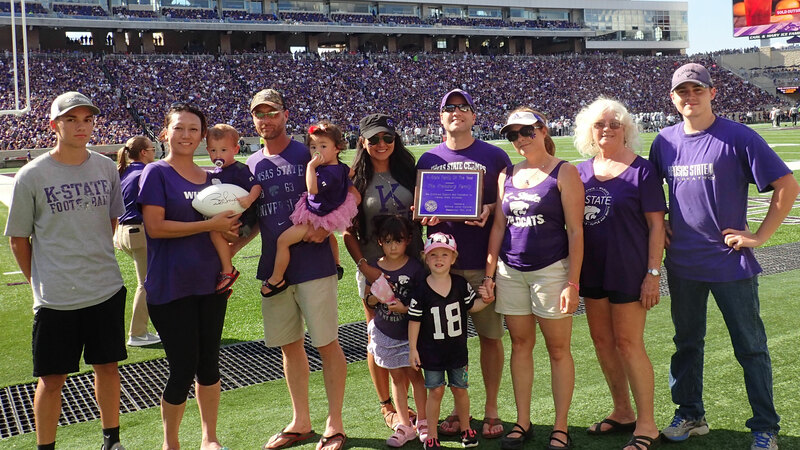 "My sister sent me a photo of her and her husband wearing K-State memorabilia in Abu Dhabi, where her husband currently works," said Richard Freisberg, who nominated his family for the award. "Our K-State pride also has been seen in Mexico, Hawaii, Germany, France, England and Japan." Chimes, K-State's junior honorary, selects the university's Family of the Year based on three criteria: how the family is affiliated with the university; the way family members show loyalty and pride in the university; and how they define family and fit the description. "The Freisberg family stood out to our organization because they have taken their pride far and wide across the country and the world," said Alexis Cherry, chair of events for Chimes Junior Honorary. "We were excited to honor a family that is dedicated enough to represent our university from all over." Although the Freisbergs live in different places, one of their favorite family traditions is to attend K-State football games and bowl games together. "Family is the center of being," Freisberg said. "Our family is spread out but we join together on many special occasions, especially K-State games!" David and Sarah Freisberg and their children Katie, Isabel and Sophie, Topeka. Rebecca and Adam Robbins, Jacksonville, Arkansas. Reese and Rumiko Freisberg and their children Alexis, Skyla and Asher, Rincon, Georgia. Stasy and Jim Taylor, Wann, Oklahoma, and their children Danielle, Alex and Jarod, Oklahoma and Florida. Jane and Heath Askew and their children Chance, Addy and Camden, Ennis, Texas. Richard and Flor Freisberg, Frisco, Texas. Anna and Allen Hoard and their children Walker, Abel, Keith (Navy-Norfolk, Virginia), Easton and Mae, Maypearl, Texas. The Freisbergs support the Wildcats at the 2012 Cotton Bowl. From left: Easton Hoard, Stasy Taylor, Rebecca Robbins, Jackie Freisberg, Flor Freisberg, Richard Freisberg, Allen Hoard and Adam Robbins. Anna Hoard, not pictured, also attended the game.| Download this photo. Rebecca and Adam Robbins show their Wildcat pride in Abu Dhabi.